An experienced speaker, Franchesca brings a mix of her experience in public education and her training as an Instructional Coach to speak about topics ranging from assessment to creating an authentic teacher brand. Please email her at info@theeducatorsroom.com or click here for more workshop topics available. Description: Have you ever assigned a ‘rock star’ writing task, but found that less then half of your students turn in the finished project? Or worse, how many times have you assigned a writing task and after releasing the kids to work they look at you in total confusion? These are situations that teachers encounter in their classrooms on daily basis. In this workshop, Franchesca uses her book Behind the Desk: How I Survived My First Ten Years in Education to give teachers specific strategies to make writing an integral part of their class and how to use writing to engage urban students. Franchesca will also give strategies on how she implemented a writing portfolio program at a Title 1, High Needs School with 100% participation. Description:How many times have you found out that a student that you teach is reading several grade levels below their current grade? Even though that child may be a struggling reader, they are still expected to read classics such as The Odyssey and Romeo and Juliet- so what is a teacher to do? In this interactive session, Franchesca will not only shares strategies to use with students who struggle to read, but to still expose them to difficult text. During this session teachers will learn about some scaffolded strategies and activities that will engage students and allow them to read the material like the independent readers in the class. Description: Are you working in a classroom where you and the students dread attending? Do students routinely skip your class, refuse to complete the work and are routinely off task? Are you struggling with even finishing the school year? 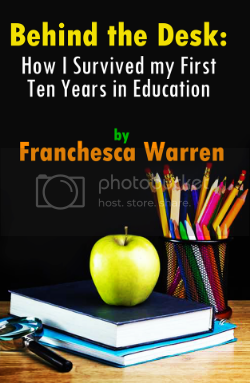 Using her book, Behind the Desk: How I Survived My First Ten Years in Education, Franchesca uses her 10+ years in education to motivate and solidify the importance of an orderly classroom in an urban environment. This interactive workshop teachers will allow teachers to experience their students experiences in their classrooms and strategies to conquer some of the biggest issues while working in an urban classroom. In addition, teachers will learn proven strategies to not only to work with but engage with difficult students in the classroom. To book a workshop please click here. Nationally, the average turnover for all teachers is 17 percent, and in urban school districts specifically, the number jumps to 20 percent, according to the National Center for Education Statistics. The National Commission on Teaching and America’s Future proffers starker numbers, estimating that one-third of all new teachers leave after three years, and 46 percent are gone within five years. With statistics this drastic it’s critical that teachers know that there are tools and strategies that will not only rejuvenate teachers, but help them navigate the political rhetoric against teachers. This interactive workshop is not only ‘hands on’, but will leave teachers ready for the next day of class! Description: How many times have you watched the news and listened to educational pundits debate issues in education, but have no experience in the classroom? How many times has your school bought a new program for your school full of strategies that you already use in your classroom? Do you have a ‘rock star’ idea that would help increase student achievement? Then it’s time for you to participant in building your teacher brand! Join us as participants will learn the five pillars to building a ‘teacher brand’ along with opportunities to make them more diverse professionals. Teachers will walk away with strategies to help make their brands stand out from the rest. and ways to increase their income from their brand.